Investors were spooked about rising input costs and falling selling prices, but futures contracts could insulate producers for a few quarters. What: It was a rough month for nitrogen fertilizer specialists CF Industries (NYSE:CF) and CVR Partners (NYSE:UAN), which both shed more than 10% in June. A combination of factors seem to have influenced the decline for each stock, but Mr. Market may be overreacting a bit. So what: Natural gas prices have historically made up roughly 75% of the manufacturing cost of the primary nitrogen-fertilizer product, ammonia. When natural gas prices are low, nitrogen-fertilizer producers usually reap the greatest profits -- and can "upgrade" ammonia into higher-value nitrogen products such as urea ammonium nitrate to capture even larger margins. That's how it's supposed to work, anyway. Despite historically low natural gas prices in recent years, especially 2015, CF Industries and CVR Partners have been faced with greatly oversupplied global markets, and crashing nitrogen-fertilizer prices. That has barred both companies from extracting any benefit from low natural-gas prices. But the situation has taken a turn for the worse in 2016. Natural gas prices have been steadily rising -- gaining 63% since early March -- while nitrogen fertilizer prices have continued to slide. The trends accelerated in June, which spooked investors. Investors are right to worry: It may take several more quarters for nitrogen markets to stabilize, which is necessary for prices to rise. However, investors may also find some solace in the fact that both CF Industries and CVR Partners hedge against volatility in the natural-gas market by purchasing futures contracts. At the end of 1Q16, CF Industries had 85% of its natural-gas requirements hedged. CVR Partners hedges a portion of its natural-gas requirements for its East Dubuque facility, while its Coffeyville Facility uses no natural gas at all, instead relying on petroleum coke (a byproduct from refining crude oil). These contracts should help shield both companies from higher prices -- for now. CVR Partners also closed a $645 million debt offering last month. While certainly needed to shore up the balance sheet in the current pricing environment, the notes are accompanied by a gaudy 9.25% interest rate. Some of that is due to the company's structure, and some of that is due to the risky nature of its business model. Investors may be a little nervous about the extra debt -- and rightfully so. Now what: Hedging practices can work both ways: helping companies beat volatility, or locking them into higher-than-market prices when they bet incorrectly. But current contracts should help CF Industries and CVR Partners to weather volatility in natural-gas prices for at least a few quarters. 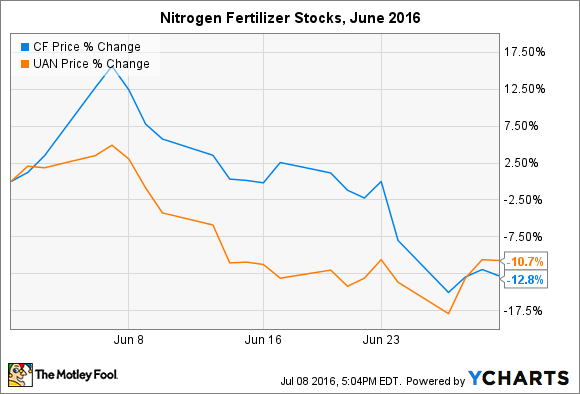 If nitrogen-fertilizer prices don't recover by then, investors may be in for some pretty sharp stock declines.